This brush is now sold out. This is a brush for the shaving enthusiast who wants a top quality brush capable of producing great lather from creams and hard soaps. And of a size and with sufficient backbone to make it suitable for face lathering in comfort while providing an exfoliating massage. The handle is 50 mm high and the brush has a knot of 22 mm with a loft of 48 mm. When dry, the tips feel quite "scritchy" yet exceptionally soft when wet. The brush has a new logo which will still be durable after a long period of regular use. Finest Silvertip is re-dressed, resorted silvertip. Any short or twisted hairs are removed, leaving the brush feeling softer and giving a lighter appearance. This also gives the brush better lathering and water holding capability. This is a high quality brush that compares favourably with those of other famous brands. Take a look at how the appearance of a well used New Forest 2211 compares with some other brushes I use regularly. The NF 2211 at £35 compares well on price with the others which range from £65 to £190 plus shipping! Left to right: Simpsons Tulip T1 Super, Rooney 3/1 Silvertip, Plisson HMW, NF 2211, Savile Row Finest Silvertip 3824, Edwin Jagger Silvertip. The brush is lathe turned and individually hand made. There will be small variations in each brush and the actual loft height may vary. If you would like the loft to be slightly higher or lower please indicate when ordering and I will try to meet your requirements. I deal direct with my manufacturer, sell direct, don't have to add VAT, have negligible overheads and seek only a fair return for my effort. Return unused within 7 days of receipt for a full refund if not entirely satisfied. 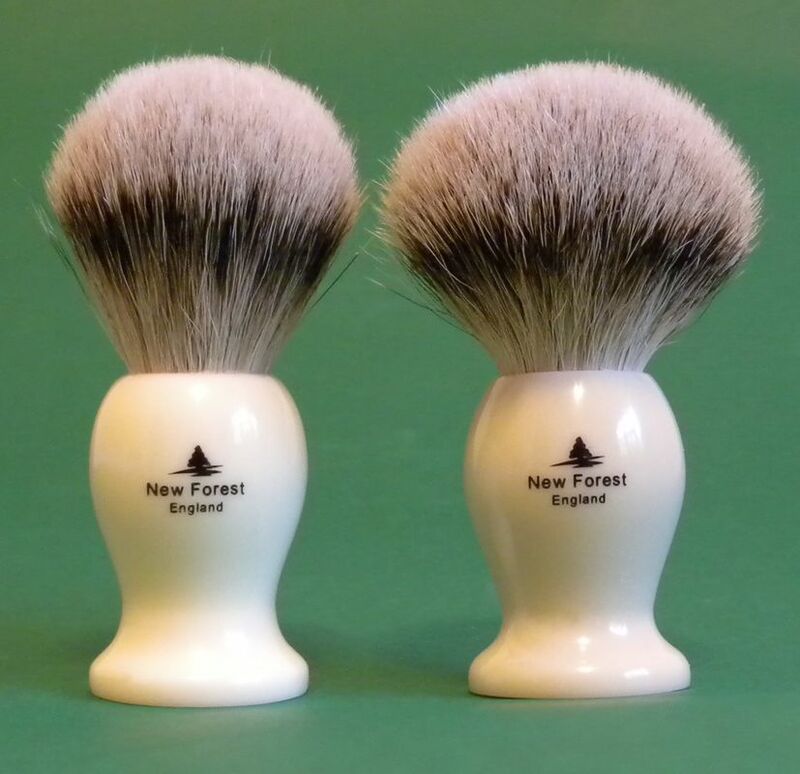 The brush will be shipped within 24 hours First Class UK and Air Mail elsewhere. Packaging - to keep costs low and to avoid waste I use simple but secure packaging - no gift box is included. Apart from me, no one had tested my latest brush, so although confident that the brush would be well received, I have been relieved to read some early very positive reviews. "The new brush arrived in the post this morning, and promptly got the breaking in and deodorising treatment by knocking up a bowlful of Taylor's sandalwood cream. Entirely unnecessary, as it turned out, although it did shed a couple of short 'n' curlies in the process. On first inspection, I understood the point of Fido's "labels" thread: it did look very similar to the 2201 brush, but not any more. "Bloom" is the delightfully poetic expression which is used for the way silvertip brushes open out and relax with use - well this one looks like a blooming tom cat that's just had a fright. Already. I really am going to love this one. Other people have covered the performance angle and I concur with what has been said: it holds a lot of water and not too much should be shaken out, and it produces, releases and at the same time retains more lather than one could reasonably expect for such a modest sized brush. It's far stiffer than a BK4 (which remains my benchmark for softness of tips, though), and gets stuck into the soap as well as any best badger or boar I've come across. So there you go, a rave review, all on the basis of one shave. I don't like to be negative, so my reviews tend to be enthusiastic, but generally there's some criticism to leaven the upbeat tone. Not in this case: in a year's time, unless it disintegrates, I fully expect to be saying that this is the best brush I own. Now, Fido, would you mind giving it a rest for a while, please? You're eating into the cut throat razor fund." Great reviews continue! Someone says I've reduced the value of peoples collections because I'm charging less than the market can bear. I'm not sure if it was a compliment or an insult.